If you do want to make a wow statement at the beach this Summer, then go for this khaki grey crochet off-shoulder dress, it’s simple, ladylike and ideally matches young ladies who want to underline their individuality. Make a wow statement with this lovely spaghetti strap crochet dress in white color. It’s a lovely Summer style for young ladies who want to underline their individuality during hot days. You definitely should give it a try. Get inspired by this simple bohemian inspired white crochet midi dress with slim straps. An ideal summer choice for young ladies who want to make a statement during special parties. I do love the relaxed fit and simple design of this frock. If you want to underline your bohemian love, then I highly recommend giving a try to this fabulous white flared dress with open crochet back. The look is completed with a pair of rounded sunglasses and hoop earrings. An ideal design for Summer road trips. 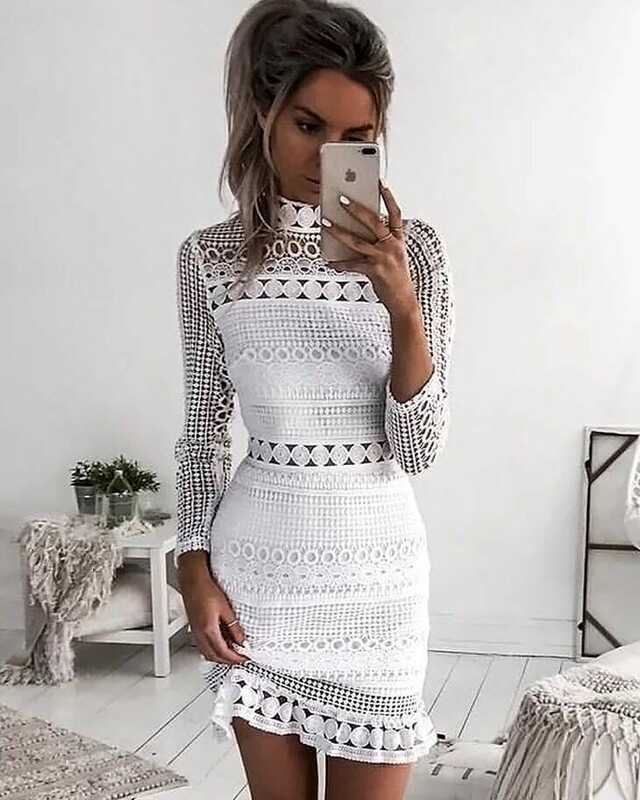 Have a look at this beautiful crochet dress in white color. It’s a sweet style for Summer season months. I do recommend to try it if you are a big fan of bohemian fashion. In love with semi-sheer crochet sleeves. Make a wow statement this Summer by wearing this simple white high-neck crochet dress during hot season months. Complete it with gold necklace and earrings. I think this dress is a good choice for wearing to cocktail parties, boho events, and beach parties.